My Top 10 Quotes from W. Clement Stone for your own personal growth and success. 1. There is little difference in people, but that little difference makes a big difference. The little difference is attitude. The big difference is whether it is positive or negative. 2. Be careful the environment you choose for it will shape you; be careful the friends you choose for you will become like them. 3. You can develop a burning desire to succeed. How? Keep your mind on the things you want and off the things you don’t want. 4. Aim for the moon. If you miss, you may hit a star. 5. Every great man, every successful man, no matter what the field of endeavor, has known the magic that lies in these words: every adversity has the seed of an equivalent or greater benefit. 6. I think there is something, more important than believing: Action! The world is full of dreamers, there aren’t enough who will move ahead and begin to take concrete steps to actualize their vision. 7. Try, try, try, and keep on trying is the rule that must be followed to become an expert in anything. 8. All personal achievement starts in the mind of the individual. Your personal achievement starts in your mind. the first step is to know exactly what your problem, goal or desire is. If you’re not clear about this, then write it down, and rewrite it until the words express precisely what you are after. Every disadvantage has an equivalent advantage – if you’ll take the trouble to find it. Learn to do that and you’ll kick the stuffing out of adversity every time. 9. 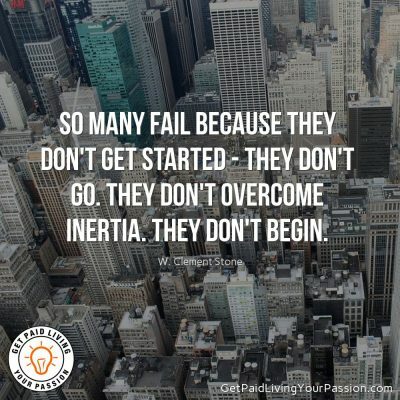 So many fail because they don’t get started – they don’t go. They don’t overcome inertia. They don’t begin. 10. To solve a problem or to reach a goal, you don’t need to know all the answers in advance. But you must have a clear idea of the problem or the goal you want to reach.